WhiteBoard and MicaBoard provides rigid board insulation around mold perimeters, between molds and platens, or on sheet dies. Mica and WhiteBoard can be utilized on a variety of applications due to their thermal and electric insulation properties: high voltage applications, extruders, and dies. Unique properties include resistance to electric arc and erosion, pressure resistance, and its non-permeability to high-frequency waves. Mica and WhiteBoard are the ideal replacement for asbestos-cement plates. Q: How do I submit the parts I need to have cut out? A: Our in house design team will accept .DWG files that are already scaled to size. If your parts require counter sinks or counter bores please be sure to specify the correct dimensions. 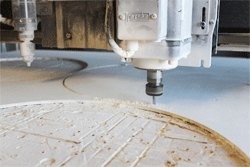 Q: Can I purchase the product without machining because I want to machine the parts myself? A: Yes, you can purchase this product by the sheet or just enough to complete a project.